Henry John White was born in Yeovil in 1893, the son of mason's labourer James White (1861-1902) and Elizabeth Jane née Grant (1863-1939). The 1901 census listed James and Elizabeth living at 52 Queen Street with their children; Henry aged 7, Earle age 5, William age 4 and 2-year old Jessie Mae. The following year another son, Percival, was born. Henry's father died in 1902 and in the 1911 census Elizabeth, now a 48-year old widow, was listed with her five children at the same address. 17-year old Henry listed his occupation as a house painter and is known to have worked for Messrs Barrett & Son of Middle Street. Henry enlisted at Yeovil in September 1916 and became Private Henry John White (Service No 19125) of 1st Battalion, Coldstream Guards. While back at Yeovil on leave in November 1916, Henry married 24-year old Elda Thorne (1892-1972), daughter of Edward Thorne and Ellen née Rowsell of 61 Beer Street. The couple didn't have time to set up home together before Henry had to return to his Regiment prior to embarking for the Western Front. & War had been declared on 4 August 1914 and all three Battalions of the Coldstream Guards were taken for active service, with the 1st Battalion in 1st Guards Brigade and the 2nd and 3rd Battalions in 4th Guards Brigade. Upon landing in France they all moved to the Belgian frontier. By the time Henry joined his regiment in France it was March 1917 and the winter of 1916-17 was spent in trench warfare on the Somme. During the summer and autumn of 1917 the 1st Battalion, Coldstream Guards were involved in the German retreat to the Hindenburg Line as well as the Second Battle of Passchendaele. The Second Battle of Passchendaele was the culminating attack during the Third Battle of Ypres and involved the 1st Battalion, Coldstream Guards. The battle took place in the Ypres Salient area of the Western Front, in and around the Belgian town of Passchendaele, between 26 October and 10 November 1917. Henry, however, was killed in action during the preparations for the attack. He was just 24. 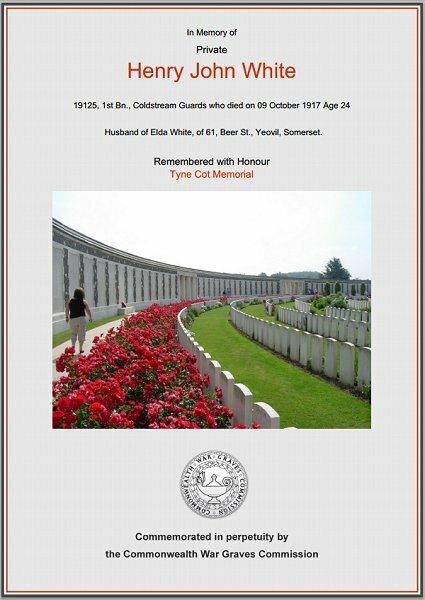 On 2 November 1917 the Western Gazette reported "Mrs HJ White, who resides with her parents at 61 Beer Street, Yeovil, received official intelligence on Tuesday morning that her husband, Private HJ White, of the Coldstream Guards, had been killed in action in France on the 9th ult. Private White, who enlisted in Sept. 1916, and proceeded to France in March of this year, was previously employed by Messrs. Barrett & Son, of Middle Street. He was a regular member of the Congregational Church, for many years a Sunday School teacher and was also a member of the Second Yeovil B.B. Profound sympathy has been expressed with the widow, mother and all other relatives in their terrible bereavement. Mrs White had been previously informed of the sad death of her husband by a lieutenant in a letter to her, but the official notification was not received till the 23rd ult." 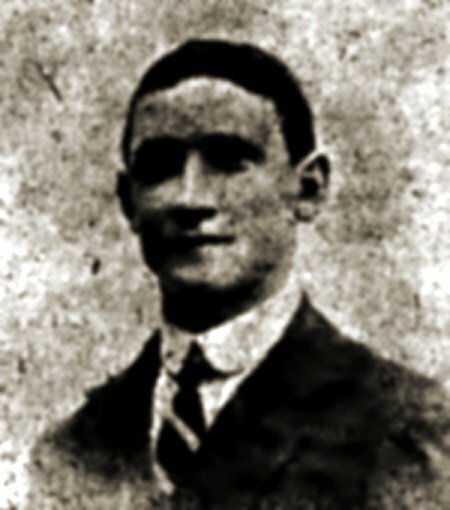 Henry John White is commemorated on the Tyne Cot Memorial, Panels 9 to 10. His name is also inscribed on the War Memorial in the Borough. Henry John White, from a newspaper. The Commonwealth War Graves Commission certificate in memory of Henry White.